Just Jingle: Three projects for Three more sleeps 'till Christmas!!! Three projects for Three more sleeps 'till Christmas!!! It's going to be a quick one today. It's crunch time, folks, what can I say? HA! I have three projects to share with you today. Two simple, super easy Christmas cards and a tag that I absolutely LOVE! This is just a basic little card, but it was kind of super crazy fun to make. I started with the four corners of the 'box' and then just worked my way in with the glitter glue dots. I love glitter!!!! This one is the result of an impulse purchase that I absolutely DO NOT regret! I don't often buy stamps since I get so many from the DT's I'm on, but I do like to pick them up on occasion. When I saw this one at Micheal's I just knew that I *needed* it! I love it! The greeting is just awesome because you don't see it every day and the image...*Sigh*...perfection! LOVE. IT. And lastly, there is this! Mmmmmm! Just look at all of that yummy texture! This one is made with lots of fun Stampendous! goodies! I used the thick embossing enamel, Stampendous! 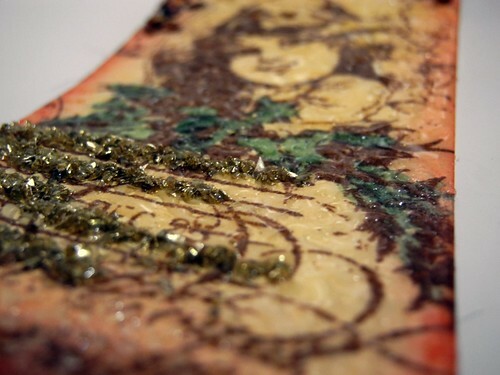 stamps, glass glitter, and mica flakes...ALL from Stampendous! LOVE. IT. Just say'n. And that May Arts silky crush ribbon tops it off perfectly! YAY for pretty things!!!! So...are you surrounded by pretty things right now? I hope so. Christmas is a time for pretty things! Happy Thursday before CHRISTMAS!!!!!!!!! Everybody loves glitter! The last one is my very favorite! fun cards...I love that tag..it is just so cool..
Oh I like them all~beautiful tag!!!! Nice cards -- love the ta! Your cards just keep getting better and better if that's even possible because they are already AWESOME!! 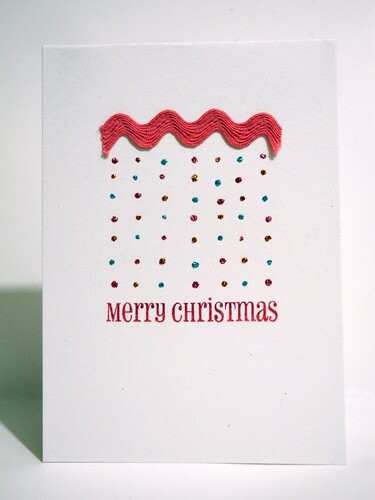 I love the red rickarack on the top of the first card...looks like a cloud that the pretty snow is falling from. OMGOSH and you know I adore the second one...love the vintage bike. I can remember riding those down the...Ohhh just kidding..I'm not that old...YET!! The tag is a true beauty. Now..go to CVS and get that candy..you deserve it. Your projects are fabulous, as always! I had candy for an 11 am snack today...Special Dark Chocolates with Almonds. Boy it was good. Hope you got your candy fix! Great projects, especially love the concept and design of the first card. Gorgeous! I absolutely love, love, LOVE, that tag, and the cards are super cute! No candy for breakfast? Yoiks. Remedy that pronto. I love all 3 projects - the dimension on that tag is something else! 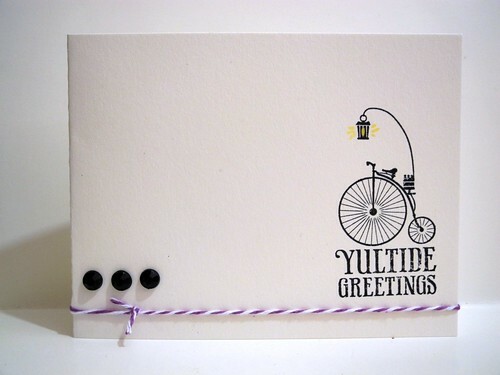 and how great is that sweet pennyfarthing bike (is that what they're called?) anyway. Love its little lantern! I love your CAS designs! So cool! The tag is absolutely stunning! Great stuff....love all of the ideas that are now floating around in my head- inspired!!! 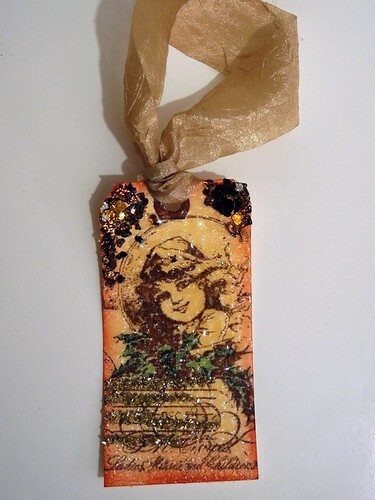 Gorgeous items on this post, but I must say the Stampendous tag ROCKS!